Porto pays homage to Scandinavian Mid Century Modern Design. Porto derives its distinct identity from the soft curves & long modernist body lines. 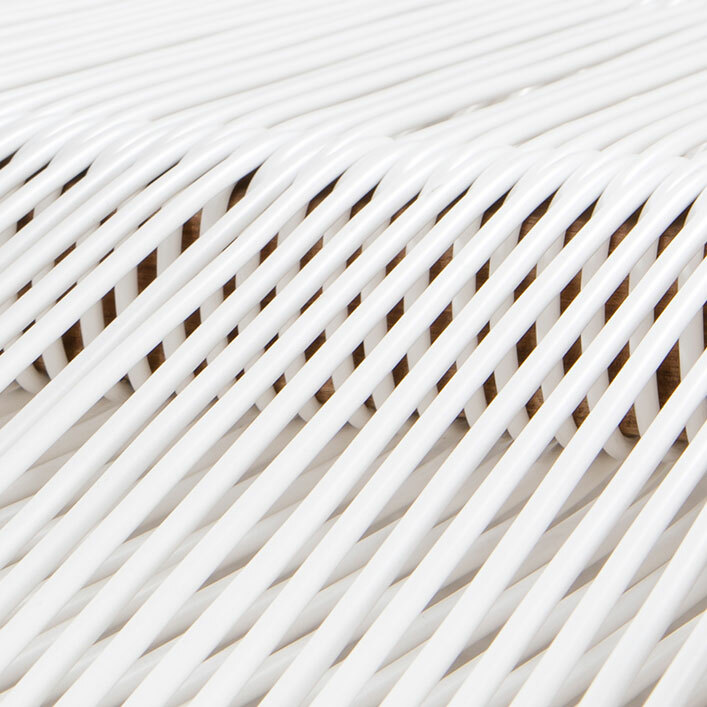 Cord and wood materials gently intertwine epitomizing the strength of design simplicity. The graceful play of wood and cord is understated. Porto lives for the outdoors. Porto utilized comfortable stretched cord for the seat and back. The seating angle has been perfected. In heat and humidity the corded seat and back breath freely for a comfortable lounging experience. The cord seat and back are low maintenance, breathable; resistant to water, mildew, abrasion. Cleaning is easy, to dust Porto off, simply spray or broom it off as needed. Thermoplastic PVC is a flexible material of exceptional strength. Thermoplastic is well suited for tension applications as it posseses strength and elasticity. When in use under weight, the material has stretch capacity which quickly retains its original shape. Weather resistant and color fast properties of Thermoplastic PVC make it an ideal choice for outdoor use under varying seasonal conditions. 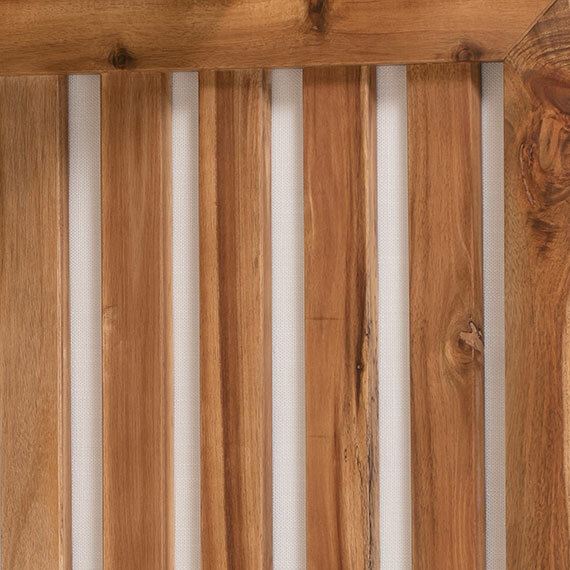 As if created for outdoor use, Acacia wood is a hard, dense & gorgeous all-weather wood. The Acacia used in the Aegean outdoor set has been kiln dried, sanded smooth & finished with a clear natural oil finish. Acacia develops a smooth even patina over time in outdoor conditions and has inherent qualities in the wood to resist pests and bugs and rot. Kardiel specializes in fast home and business delivery of modern classic furniture and bath products across the U.S including Hawaii and Alaska. We dispatch shipments to homes all over Canada daily. Using proven, reliable nationwide delivery methods we insure and guarantee safe delivery of all shipments. We provide standard curbside residential delivery as well as inside White Glove full service delivery as options for many of the regions we ship to. The best value for those looking for a full service delivery experience with no lifting or physical effort involved. A team of 2 rigorously screened home delivery professionals arrive on a day and time prescheduled with you. Your furnishings are brought into your home and placed in the desired location in the room(s) of your choice. The furniture is removed from the packaging/boxes. The old packaging material is then placed in a designated location. Perhaps you need door(s) removed and replaced? Maybe you live in a condo or high rise building? Maybe there are flight(s) of stairs to climb? The safe arrival of your items is guaranteed and no obstacle is too large. We will do anything necessary to complete your delivery with quality, care and a smile. Average delivery times are 9-12 business days from the day your order leaves the Kardiel warehouse. This economical delivery option brings your new furnishings direct to your home or business. The term curbside indicates that the items are brought to the "curb" but not inside the home. This is a signed delivery option which means you will need to be present to accept the delivery. You will need to be prepared to carry the items into your home or office as this service does not include inside delivery. Tracking numbers are provided within 24 hours of your order leaving the Kardiel warehouse. Average delivery times nationwide for this service are 7-10 business days from the day the shipment leaves the Kardiel warehouse. The delivery is guaranteed safe when you inspect and sign with the driver for any potential shipping damage. The delivery company calls to schedule the delivery date and window of time as the arrival date of your items draws closer. Alaska and Hawaii customers please contact us by phone to receive a custom discounted delivery quote for your shipment prior to purchasing.